Phra Phong Supan were discovered on B.E. 2456 in Wat Phra Sri Ratanamahathat in Supanburi province. According to a golden scripture found together in the pagoda which described that Phra Phong Supan was created by Phra Mahathera PiyaThassi Saribut during the period of King Bormrajathiraj 2nd. It has strong "U-thong" art style. Most of unique of this amulets is at the back had a thumb print of the creator. A superb Buddha amulets had all mighty protective power against weapon and bring good luck. Is the most powerful amulets of ever. Phra Pong Suphan amulets form part of the Benjapakees set. In general these amulets are beyond the budget of the average collector; however amulets blessed by Luanfg Phor Dee are considered a great contemporary alternative. 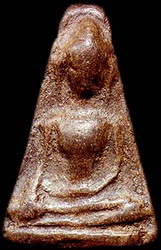 Generally triangular in shape with Buddha seated in the "Manvichai" posture. 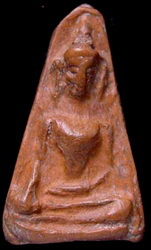 The protruding chest is the most prominent feature of this clay amulet. It has strong "U-thong" style influence. Thai people believed it would bring good luck and wealth. A unique characteristic often seen on the reverse of these amulets is the imprint of a thumb that was left by the artist who made them. They are from the Chedi of Wat Mahathad in Suphan Buri Province and estimated to be approximately 500-600 years old. LP Dee Jatomloh, or Pra Kru Sunton Suwangit, Wat Praroop was respected as one of the most merciful monks of his era, showing great compassion to all that would visit his temple, whether they were rich or poor. He was born on the 7th August 2454, and ordained a monk at the age of 23 at Wat Sainawat, SuphanburiLuang Phor Dee was noted for the many amulets that he created, the proceeds of which were used towards the re-construction and renovation of the temple. Luang Phor Dee had collected many old amulets and in particular Pra Pong Supan and Pra Somdej of Wat Rakhang. He also collected other old amulets form many of the temples in Supnaburi province such as Wat Praroop, Wat Mahatart during the period BE 2400-BE 2508 and BE 2508 – BE 2513. He used these amulets to create the powder with which formed the basis of his own amulets. Luang Por Dee always pressed these sacred materials ground from the sacred materials that he would collect into the moulds by himself. He was only able to make a limited number on a daily basis, many of which now are quite valuable.